Last Sunday, my cousins and I finally made it out to Paulette's for some fried chicken and doughnuts, we had all been dying to go since it opened in July. When we walked in to the small store front we were all instantly greeted by friendly staff dressed in an old fashioned diner hats and uniforms. This trendy spot is set up strictly for take-out, though there are benches outside the door. We decided to cross the street and eat at a picnic table in the public park. We ordered one CHICKEN COMBO between the 4 of us to share. We figured one piece each would be enough for we wanted to leave room for some doughnuts. The combo came with 2 pieces of white meat and 2 pieces of dark meat, one dipping sauce and one side dish. We could not distinguish the dark meat from the white but none of us really minded that. The Fried Chicken was so crispy and delicious yet not at all greasy. The skin was well seasoned and perfectly fried; it crackled with every bite we took. At first we were a little nervous that the meat would be dried out because the skin was so crispy, but we were pleasantly surprised it was still moist and juicy. We couldn't decided which side sauces to get, so we got a few to try, including the Tandori BBQ sauce (which featured a variety of very spicy indian flavours. 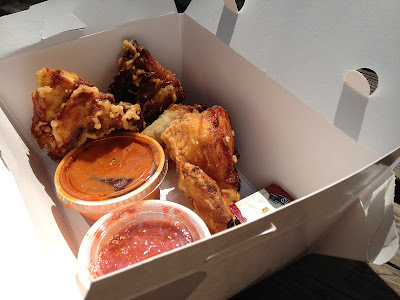 it was not my favourite but JB liked it) and the house made hot sauce which I liked the best. One thing we could all agree on was ordering the side MAC AND CHEESE. 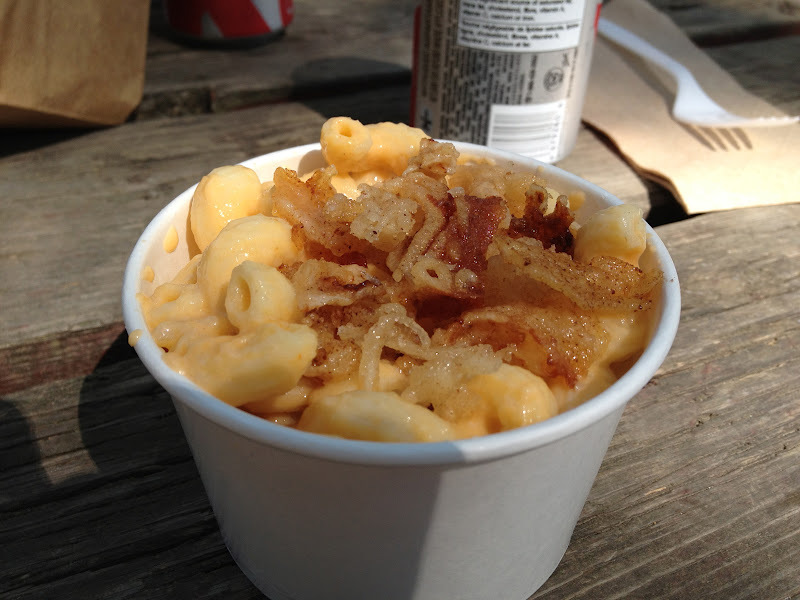 The macaroni was smothered in a thick, creamy sharp cheddar cheese sauce and topped with crispy chicken skins. It's making my moth water just thinking about it. We should have ordered a large; we were all fighting for the last bite. to this point we were very pleased with our choices. All we had left to try were the doughnuts. My cousins, who are both pastry chefs, were especially excited. We ordered the BLUE BERRY BALSAMIC, COCONUT BANANA CREAM, CINNIMON SUGAR and the MOJITO DOUGHNUT. We were largely disappointed by all of them. They were dry, overly sweet and very dense. We all would have rather gone to Tim Hortons for our after dinner treat. Would we go back? Yes. But for Chicken only!